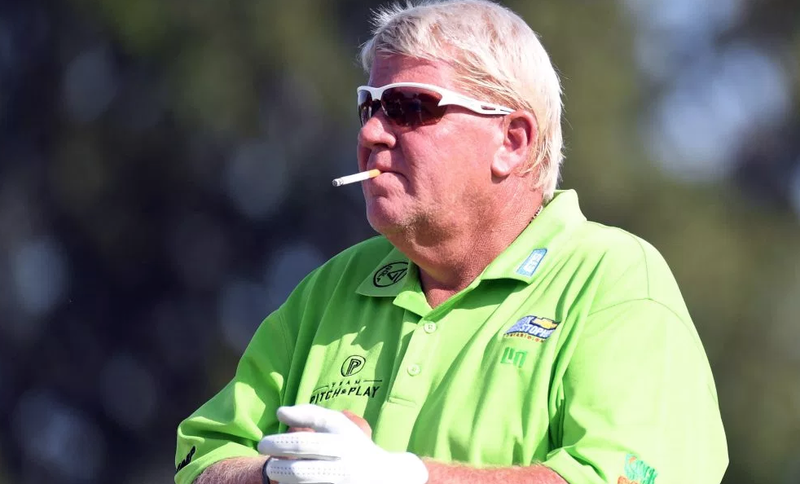 "The Daly Show has long since become tediously repetitive viewing"
Eamon Lynch files a tough but necessary take down of John Daly's U.S. Senior Open tantrum over not getting a cart. After reviewing some of Long John's greatest WD hits--only 11 signed scorecard rounds in USGA events--Lynch says there is nothing left to like about Daly's act. For a time, Daly was an easy guy to root for among the khaki clones that populate the PGA Tour, a mullet-sporting, beer-bellied, working-class guy upending a country club world. His many struggles with addiction – which he hid from no one – earned him tremendous support from fans and more than a few passes for conduct unbecoming. But the Daly Show has long since become tediously repetitive viewing. He’s 52 now, but maturity seems no nearer at hand. It’s easy to understand why tournament organizers have bestowed so many sponsor’s invites on a man who hasn’t had playing status for years. When he pitches up at events, TV announcers still serve up the old chestnuts: Folks love to see him, he draws a crowd, he generates the oohs and aahs. That’s all true, of course, but it’s also true of police car chases. And people watch both hoping for a crash. Daly is listed as part of the field for this week's Greenbrier Classic. Presumably able to play without the aid of a cart. You have two weeks and the bidding's at $30,000 on the Heritage Auction site. I don't remember any Jug's going up for sale in recent times, so this should get interesting. Bill Speros with the details at Golfweek.com. Normally I'd suggest John Daly abstain from wagon references given his multiple climbs on and off the wagon, but the man loves his President Trump and the job the 45th president is doing. Ryan Ballengee, reporting from the KitchenAid Senior PGA Championship That'll Eventually Be Won By Bernhard Langer, quotes the 2-time major champion loving the effort of his friend Donald Trump, unofficial host at Trump National DC. Kind of glad Herb Wind didn't have to do a New Yorker piece on this birthday. John Daly gets a more appropriate retrospective from the SkratchTV gang. Oh, and Fuzzy owes Long John $150k according to USA Today's Josh Peter, money that will be well spent no doubt. PS - Long John, two majors...shouldn't he be on a World Golf Hall of Fame ballot? GolfDigest.com's Alex Myers reports on the first real golf topic getting a full-length treatment from ESPN. The revelation came from ESPN's John Skipper during the upfronts. The only other 30 for 30 documentary topic on golf was a short on the Arnold Palmer drink. Perhaps a fresh spin on Daly's improbably PGA win? Nice spot by the Golf News Net and thanks to reader Steve for sending along this gem of a Halloween costume. It seems one Jonathan Trunk entered his 2-year-old son into Rock Bottom Golf’s John Daly Halloween dress-alike contest. After a 68 in the opening round of the BMW Masters in his first tournament since elbow surgery, John Daly was a entertaining as ever in sharing his secret to a quick recovery. John Daly To Vijay: "Don't do this"..."Not worth it"
John Daly took to Twitter to offer Vijay Singh some advice: don't take on the PGA Tour. There is a very powerful December Golf Digest story by Stina Sternberg that's a powerful, informative but in no way maudlin read (the print issue should hit your mailbox any day if it hasn't already, and the iPad edition is out). Though Kim is the focus (and kudos to her for sharing her story to overcome the stigma attached to admitting issues with depression), she's certainly not alone. According to the National Institute of Mental Health, 14.8 million American adults--or 6.7 percent of the U.S. population--suffer from Major Depressive Disorder, and more than 30,000 Americans commit suicide every year. "It's a huge medical illness on the order of cardiovascular disease and diabetes," says Dr. Michael Lardon, a San Diego-based clinical psychiatrist who specializes in working with professional athletes and has been treating tour players, including half a dozen major champions, for 21 years. (This is the first year he has no LPGA Tour patients, but he currently works with 10 players each from the PGA and Web.com tours.) "Unfortunately, it lives in the background." 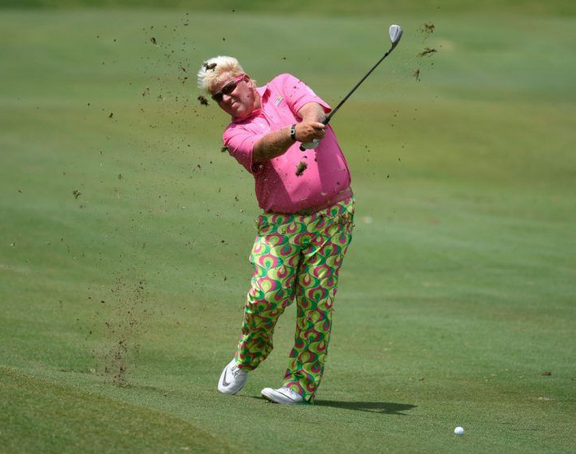 Golf's Unsolved Mysteries Files: Why Does John Daly Keep Getting Sponsor Invites? After his 63-86 in Las Vegas, the inevitable questions arose in the local papers that John Daly had given up during his round, prompting John Strege to solve a golf riddle right up there with why does anyone watch The Big Break? Daly was nine shots better on Sunday, though a 77 is more fodder for the argument that he doesn't warrant the sponsor exemptions that continue unabated. The attraction is what, bad golf or bad behavior? He has finished in the top 10 only twice in the last seven years and has withdrawn from tournaments 12 times in the same period, while playing almost exclusively on the benevolence of sponsors. He had to pitch in for birdie on 17 to get that 86 too. This shot with Tiger should make up for the family Labor Day photo John Daly posted on Facebook. Thanks to reader Tom for the tip. Video Confirmation: Both Daly And Feherty Are Nuts! I missed the season finale of Feherty last night but I'm guessing there will be repeat airings for the next few weeks. And this is worth watching on a big screen because it's just that insane. Another to file away for the six-months-to-live-and-I-want-it-to-seem-like-six-years file. At least this time Long John didn't perform Dylan's Knockin On Heaven's Door for Make-A-Wish children, but instead for unsuspecting dinner guests in Thailand. So I consider this progress. Daly Adds A No-Show To Latest Run, Has His Banishment Begun? An AP report quotes organizers of the South African Open saying John Daly did not "snub" their event, believed to be his final appearance anywhere for a while after intentionally dumping balls in the lake at The Lakes. Promoter Mbali Ngqula dismissed reports that Daly had refused to play the European Tour event after his fiery exit from the recent Australian Open, where he hit a string of shots into a lake and then quit saying he had run out of balls. Ngqula said on Thursday "it is wrong to suggest that John snubbed our invitation, he did no such thing." Ngqula said Daly was "very willing" to play the South African Open but had been unable to make it in time. "Members are welcome to forward this email to all their golfing friends." "Surely John Daly has disgraced golf for the last time." It's hard to fathom that John Daly could overshadow this Australian Open, what with its eye-popping course, star-studded field, quality leaderboard and huge fan turnout. But the actions suggest this might finally be the time Daly is retired from the sponsor-invite circuit.